Other Distinguishing Features: Ant is covered by a bright red shell and has two antenna on her head. 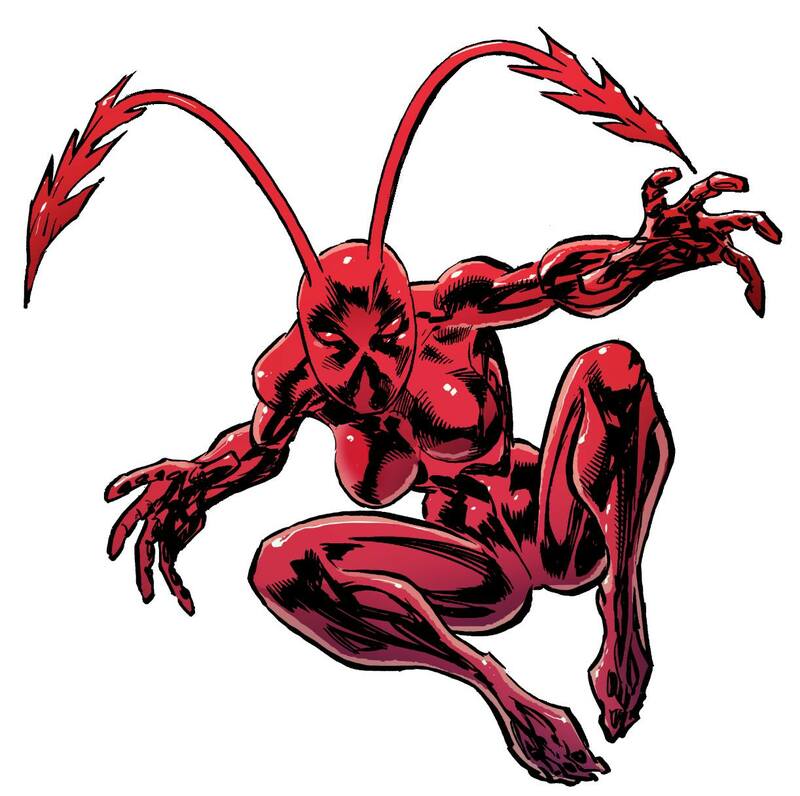 Powers: Ant has enhanced strength and agility and the ability to cling to walls. Her entire body is coated by a protective shell, which she can control with her mind. NOTE: Ant is owned by Erik Larsen, but was originally created by Mario Gully. Tormented as a child, Hannah Washington dreamed of being a superhero and often drew her alter ego, Ant, in her diary. When her scientist father was tasked with finding a solution to help man survive a nuclear holocaust, he drew inspiration from his daughter’s drawings and helped develop an organic, nearly-impenetrable shell which could reside within its host’s body and be released to cover them entirely from head to toe. When her father discovered that evil forces wanted to use his creation to survive a disaster of their design, he fled, taking his solution (in serum form) and his young daughter with him. With her father hurt, and the two trapped, Hannah injected herself with the serum in an attempt to hide it from the assailants save her father’s life. Ant has had various adventures and has been in and out of the government’s custody. She has been drugged, mind-controlled, and used as a weapon against adversaries foreign and domestic. Much of her past is shrouded in mystery and she has trouble discerning her fantasies from reality. She has suffered amnesia in the past. Because of her situation, she is highly paranoid and suspicious of authorities. Hannah is concerned about a group determined to cause the Biblical Rapture and has sought to ally herself with Spawn and Malcolm Dragon. She later helps Malcolm fight off a possessed Ragnok.